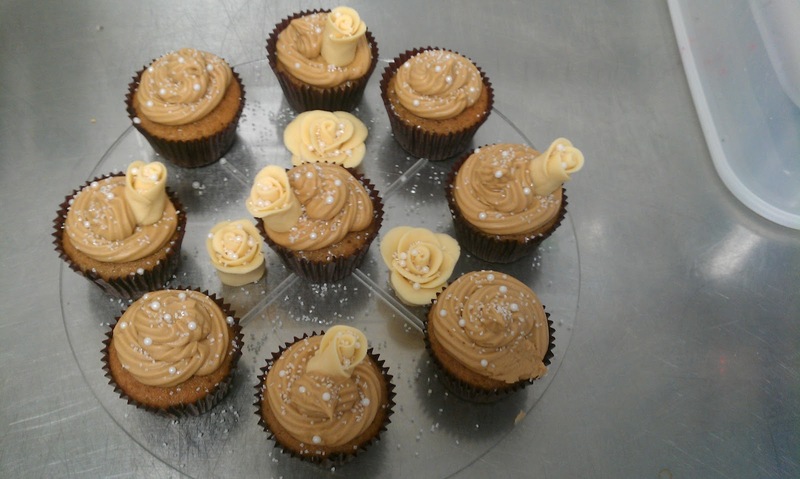 I am sooo pleased with how this very decadent little spread of cupcakes turned out! This was a really succesful, pretty quick and easy way to decorate my cupcakes beautifully. I really like the dark brown cupcake cases, they just look so much more glamorous and elegant than plain white ones. 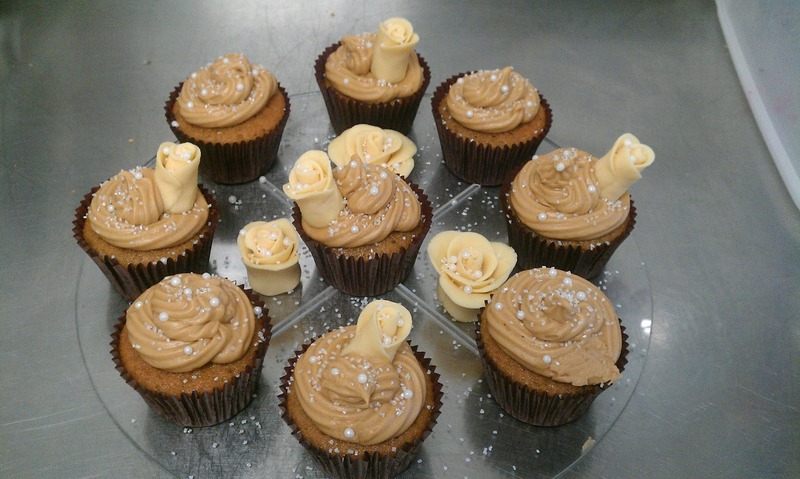 I made up a batch of coffee flavour cupcakes, topped with swirled coffee buttercream (using a piping bag with a serrated-end nozzle, and decorated with white chocolate roses, white sanding sugar, and white sugar pearls. For the cakes with chocolate rose buds on top, I piped on the bootom layer of icing, placed the roses, and sprinkled with sanding sugar (sugar glitter) and pearls then left the icing to dry and harden up a little on the outside (about 30 minutes). Then I swirled more icing on top and around the rose bud to neatly hide the (slightly messy) bottom of the bud from view, and make the icing nice and neat (I just know that if I had put the roses into the finished icing I would have ended up blobbing it everywhere and making a mighty mess!). I then sprinkled again with sanding sugar and added more white sugar pearls where I wanted them. The cakes are sitting on a clear acrylic circular board which comes from a 7 tier acrylic cupcake-stand. As seen in my treaty towers post. 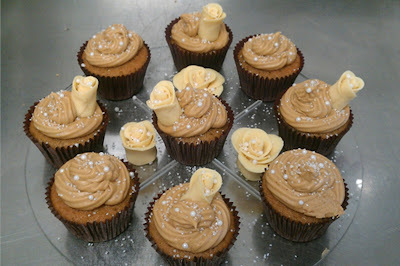 I placed chocolate roses around the cupcakes then sprinkled over with more sanding sugar and pearls. In this instance I only needed a small number of cakes, but I could easily have run with this theme up all 7 tiers of my cupcake tower. This was a really easy way to decorate a set of cupcakes! I made my own chocolate roses, which was quite time consuming, but if you don't have the time these can be bought ready made. I'm quite looking forward to making a variation of something like this with a bit of red and green for christmas, and maybe poinsettia flowers instead of roses (6 months early I know, but it's impossible to be TOO excited about Christmas! ... Though some parents may share a difference of opinion on this one).